On February 10, 1987 an unidentified body of a female was found in a landfill near Harper Avenue on the east side of Detroit, Michigan. The woman had been deceased less than 2 days before being found. She had been stabbed to death, her throat slit, and was likely sexually assaulted. The woman was between 16-25 years old, stood approximately 5’5″ tall, and weighed around 114 pounds. She had hazel or light brown eyes and brown hair styled in layers and recently highlighted blonde with reddish tints. Her earlobes were pierced once. She had good oral hygiene and dental care. The woman had given birth within 2 months to a year before she died. She was still lactating and had an episiotomy scar. She was found wearing two silver rings: one was a thin band with a small rope design in the middle. The second was larger with a marquee cut center clear stone in the middle with round clear stones around the sides. In November 2014, the body was exhumed in order to obtain a DNA sample, which later proved insufficient for profiling. 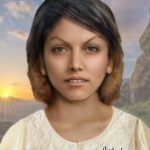 The facial reconstruction (above) was provided by the Michigan State Police and depicts what the woman may have looked like in life. As of February 22, 2019 DNA for Harper Jane Doe is undergoing sequencing. If successful, a GEDmatch file should be available in March.